Well, now there’s another, more practical product for those who like the idea of Chipotle, but don’t relish its execution. It’s called Dos Toros, and it makes excellent assembly-line burritos and tacos. Really delicious and winning. The setup should be quite familiar. A storefront, and an assembly line. 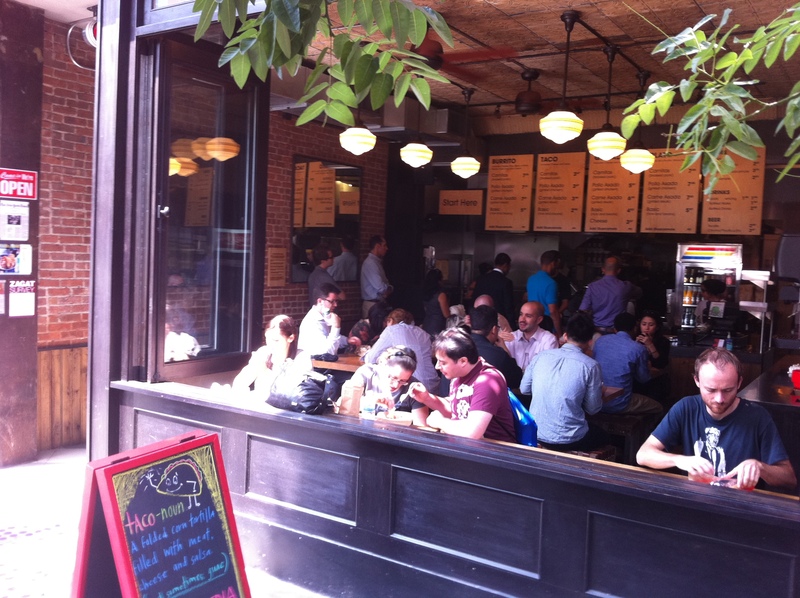 This being the village, the employees and crowd tend toward hipsterdom. There’s usually a lot of attractive young people about, either in front of or behind the counter. It’s nice. One thing that you’ll immediately notice when you order a burrito is how thin and slight-seeming the tortilla they use is. 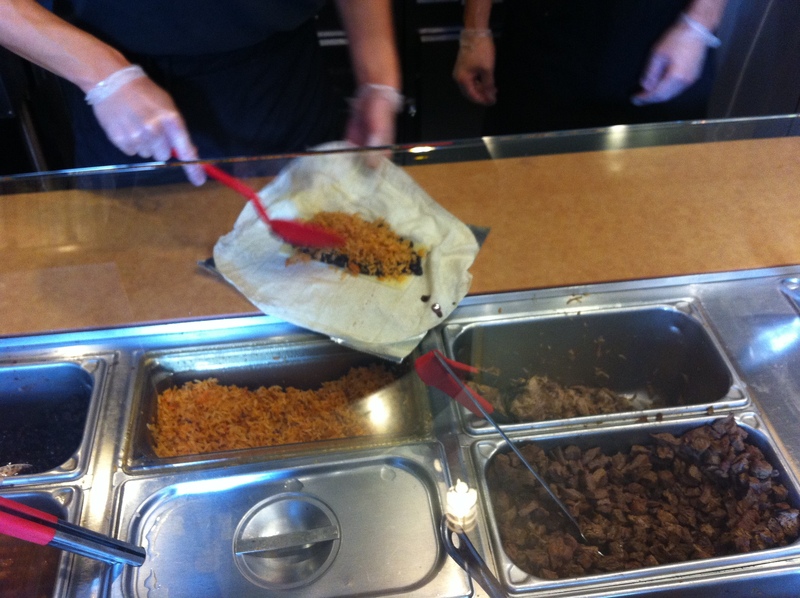 To me, that was a very good sign, I recall in California the burritos there had a similar, whisper-thin tortilla. That said, it also made me concerned about its structural integrity: Would it hold up or rupture? The procedure, by the way, is exceedingly straightforward. Choose whether you’d like a burrito, taco or “bowl,” which is a burrito sans tortilla, choose red or black beans, choose your protein and toppings. Very simple. Looks really vibrant and fresh! I get the works: Their spicy pork, pico de gallo, guac and sour cream. Basically, if they have it, I tell them to put it on. I balk, though, at their very hot hot sauce, getting the milder one instead. It’s worth noting they also sell cheap beer… . The burrito was about $10, give or take. Their assembly line is quick and efficient, and I was struck both by the substantial size of the portion and how fresh all the ingredients seemed to be. The guacamole and pico de gallo were bursting with color. Guac turns brown quick, so that left an impression on me. OK, so I’m a bit late to the party. OK, I admit it, I am a bit late in catching on to this place. I didn’t know about it until it opened next to the sensational Joe’s Pizza on Carmine Street. 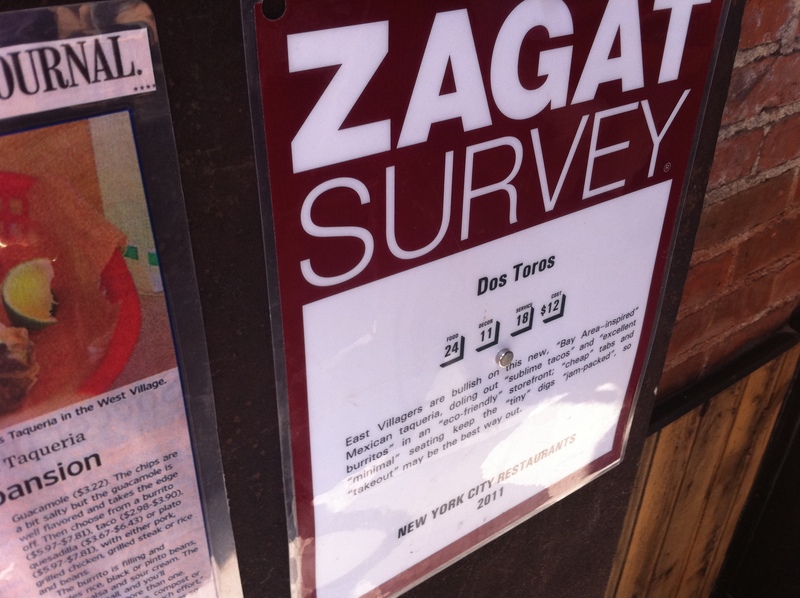 But Zagat gave it a 24, that’s a pretty triumphant rating. Could it live up to it? In a word: Absolutely. It was absolutely delicious. I believe it’s latin name is “Burritus Superioris,” subsection Splendido. What can I say? I really enjoyed it. It’s hefty and was still nice and hot by the time I got back to my desk several blocks away. There’s some spice, not too much, to it. 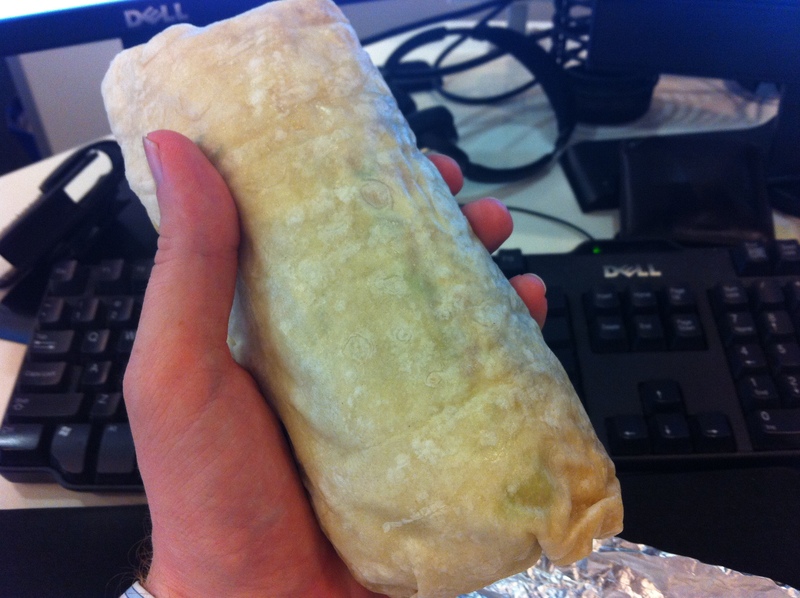 The burrito wrap held up beautifully and only ruptured at the bite. I could actually taste the pork, which at many Mexican joints is difficult to do. I further was able to make out the individual flavors of everything I was eating, as opposed to having them all merge into a goop, as happens at so many other places. Furthermore, for food that was coming out of steam trays, it wasn’t runny. The spice kept on coming, rising to a considerable heat by the time I was finished. The guac and pico de gallo, every flavor of them popped when it touched my tongue. What can I say? Dos Toros is impressive. 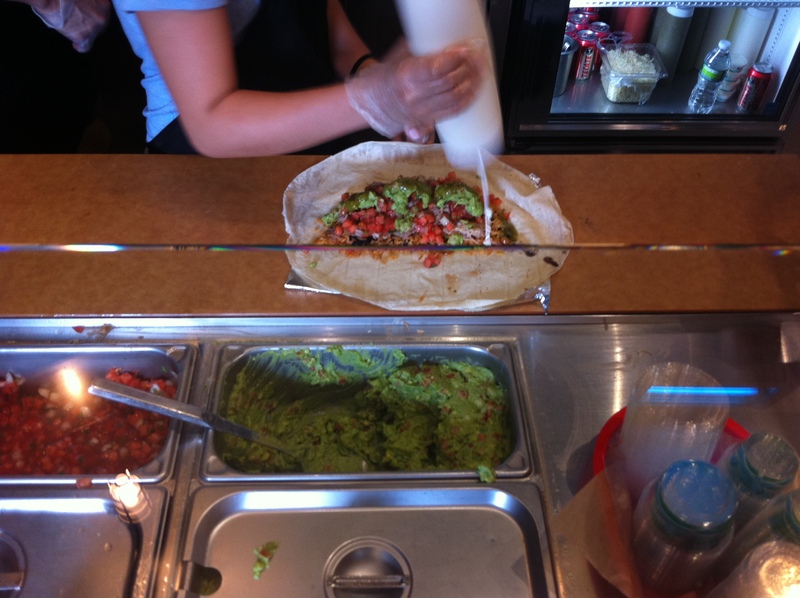 It is a welcome improvement over Chipotle, even if it follows the same basic design.